Auto-Shut : 2 minutes automatic shut off without operation ,So battery won't run down. Lock function - Makes it easier to read and record, Press HOLD button then remove from test solution. 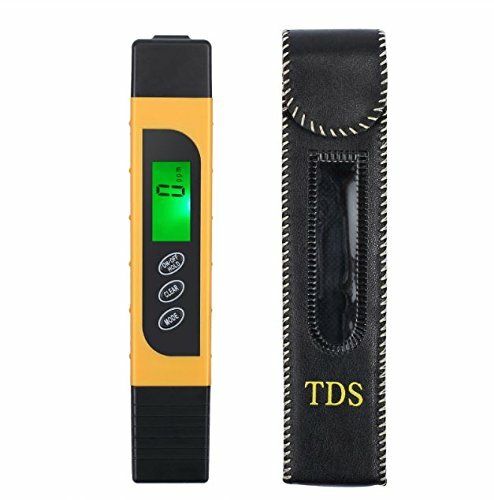 This advanced water hardness test kit combines TDS (Total Dissolved Solids), EC (Electrical Conductivity) and Temperature meter 3 in 1 digital test pen,Provide a detail and accurate report on the water quality of you drinking or the water used for your pets, fish and gardening.Automatic temperature compensation ensures the readings are accurate in cold and warm water. 4 Display Modes: TDS - ppm & °C, EC - µs/cm & °C, TDS - ppm & °F, EC - µs/cm & °F. (Press SHIFT button to convert) / Auto-Shut : 2 minutes automatic shut off without operation ,So battery won't run down. If you have any questions about this product by Cypress Shop, contact us by completing and submitting the form below. If you are looking for a specif part number, please include it with your message.